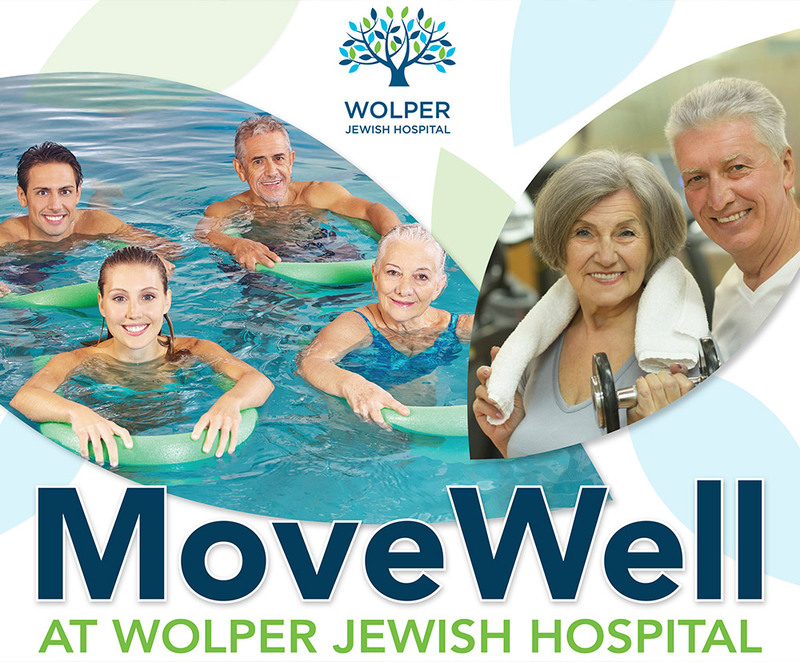 Wolper’s MoveWell Program offers a range of community exercise classes tailored to specific conditions including chronic diseases, falls and balance management, chronic fatigue management, Parkinson’s Disease, diabetes, arthritis, osteoporosis and musculoskeletal conditions. Classes offered include aqua-aerobics and aquacore, general strengthening, balance and falls prevention, Parkinson’s classes and Tai Chi. Classes are of approximately 45 minutes duration and are lead by either accredited exercise physiologists or physiotherapists in small group settings. MoveWell classes are open to all individuals. A GP medical clearance may be required. Participants are required to complete a medical clearance form prior to commencing class. Please click here for the form. Participants are also required to sign the Movewell Terms & Conditions form. Please click here for the form. Suitable for community participants that are independent and looking to improve strength, flexibility and fitness. Class is conducted in a circuit format using exercise machines and free weights to strength whole body and improve fitness. Tai Chi is a gentle form of exercise focusing on slow, controlled movements. Benefits include improvements in strength, posture, balance, mental relaxation and breath control. It is a low impact form of exercise, suitable for those with arthritis and osteoporosis, reduced balance, heart conditions and back pain. Specifically designed for people with chronic lower back pain to target strength, functional movement and flexibility. Exercises aim to improve spinal health and overall body awareness. Class is suitable for community participants who are independent or use a walking stick/frame. Exercises focus on balance, leg strength and posture to reduce the use of aid and prevent falls. This circuit class is based on the LSVT Big protocol and focuses on high amplitude, big movements in order to improve strength, balance and confidence. Classes focus on increasing and maintaining body strength, flexibility and function via water-based exercise which supports the body and reduces impact on joints. 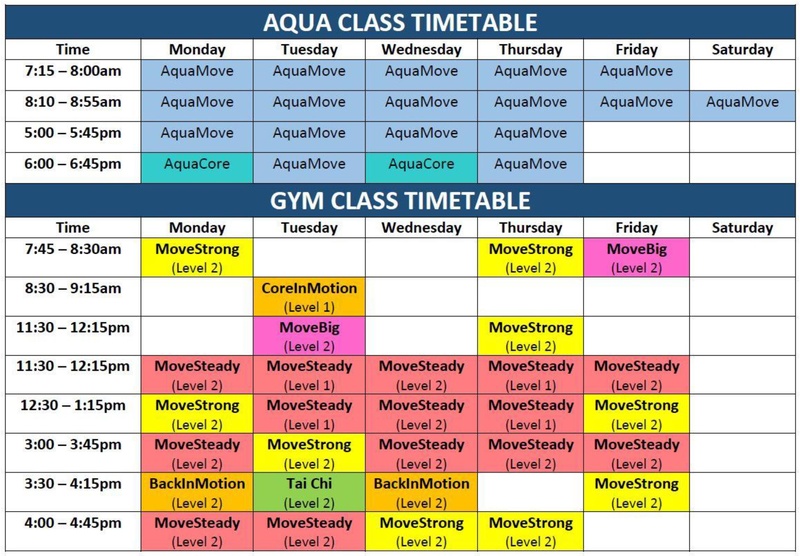 Classes designed to strengthen the deep muscles around the spine and the pelvic floor muscles via water based exercise. Classes are suitable for individuals with pelvic floor weakness, pre/post natal, and spinal injuries/conditions. Women’s only Wednesday night 6pm class- focusing on pre/post natal, pelvic floor weakness and postural correction.